•	Pre-heat oven to 375 degrees F with a rack in the middle. •	Place water and 2 tablespoons kosher salt in a large stockpot and bring to a boil. Add pasta and cook for 7-9 minutes until al dente. Drain and set aside. •	While your pasta is cooking, start on the cheese sauce. Butter 8 ramekins or 1 9x13 inch pan and set aside. •	Melt butter in a large stockpot over medium heat. Then add flour, lower to medium low and whisk constantly for 2-3 minutes to make a roux. It should be light brown and smell nutty. Careful not to let it burn. •	Add warmed milk and half and half, turn the heat to medium high and bring to a boil, whisking constantly. Lower to a simmer and simmer until thick enough to coat the back of a spoon and smooth about 2-3 minutes. 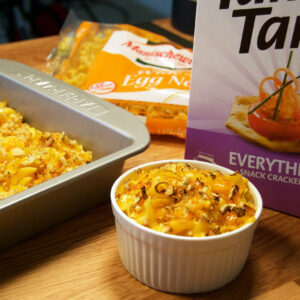 •	Lower the heat to low and add the cream cheese, and gradually add the cheddar cheese and stir to melt. Then add the dry mustard, paprika and salt and stir. •	Add pasta and stir. Spoon into ramekins or the pan. •	For make topping, melt butter in a small saucepan or the microwave in 30 second increments until melted. Remove from heat and stir in Tam Tams and cheese. •	Top ramekins or pan with Tam Tam topping, place on sheet pans and bake for 20 minutes until the cheese is melted, bubbly and well browned. Let cool 5 minutes and eat! Recipe by- Amy Kritzer who is the founder of the award-winning blog http://whatjewwannaeat.com/, the author of Sweet Noshings and the owner of https://moderntribe.com/. In her spare time, she enjoys theme parties and glitter.